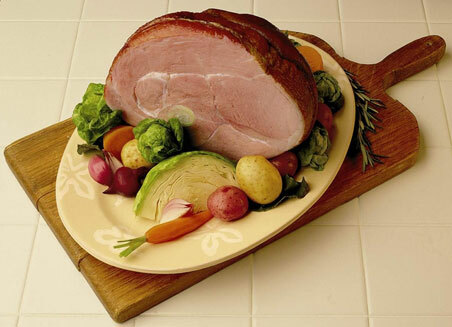 Fresh ham is one of the favorite foods served during the Holiday season. Nothing beats eating a delicious and yummy smoke fresh ham. Smoking is a cooking process of infusing the flavor of a certain wood chips such as maple, cherry, apple or hickory in to the meat. This gives the meat that distinct and yummy flavor. The ham will then be hung or put on top of the rack inside the meat smoker where the chips will produce a smelling smoke with a sweet flavor to it. The internal temperature as per regulation must be around 160 degrees. Smoke fresh hams are good during Christmas Eve dinner, picnic, or even as snacks for the kids. Always remember to choose nothing but the freshest ham in the market to get the best smoke fresh ham in town. Soak the wood chips with water, in this way they will not burn when in contact with the heat of the fire. Put the charcoal right at the bottom of the meat smoker. Let the charcoal burn for about 10-15 minutes. Put the soaked apple, maple, hickory or cherry chips right on top of the hot coals. Put the ham right on the rack found in the meat smoker. Keep the temperature level between 200-225 degrees. In order to check the temperature of the meat, stick the thermometer right towards the meaty part of the ham but not towards the bone. Then, put on the lid and let the ham cook for about 9-10 hours. When you see the wood chips are running out, replace them as needed. The chips are needed in order to obtain good smoke while cooking the ham. While waiting for the ham to cook, make a glaze. All you have to do is combine brown sugar and mustard. Brush the ham with glaze and put in the cloves right inside the meat. Put on the glaze couple of minutes before the ham gets cook after which, wait for 15-20 minutes to finish smoking the fresh ham.